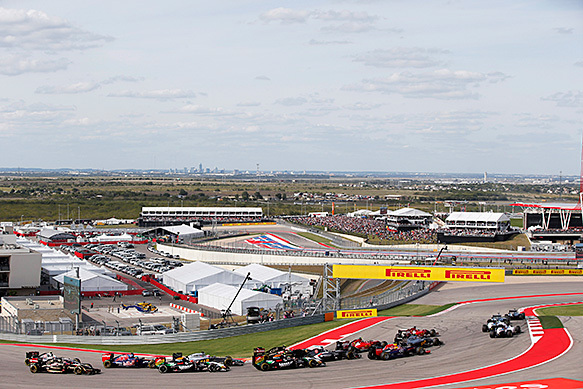 During the United States Grand Prix weekend, there was endless talk about Formula 1's financial situation and the risk of the grid falling below even the current 18. As usual, that talk led to nothing but more talk, which has been the normal way of things in F1 for the past decade at least. F1 has already lost two teams so it's vital that action is taken now to ensure that there are enough cars on track to make sure there's a show for the fans to watch. My suggestion is that the big works teams must pair up with a smaller outfit, which will become the junior team. The works teams are, in reality, defined by the engine suppliers. So currently we have Mercedes, Red Bull-Renault and Ferrari, with McLaren-Honda joining next season. So each of those four should, by regulation, be forced to have a junior team. The works team would have to supply and cover the costs of a season's worth of racing and testing of power units and transmissions plus all the necessary equipment and personnel to run this package. On top of that, there could be the option to purchase running components not included in the so-called 'listed parts' that a team must produce itself to be considered a constructor. I would suggest upright assemblies and drive lines could be purchased but the aerodynamic surfaces must remain the individual team's intellectual property. A long-term contract needs to be in place, I would suggest for at least three years. This would be required to give the junior team the necessary stability. While the junior team would be gifted its engine and transmission, it would still exist as a sustainable constructor by producing its own car and completing its own development work. It would also protect a lot of jobs. They would still produce their own monocoque as well as having their own brand, so this technical relationship would not threaten the identity of teams like Sauber and Force India. The drivers could be selected in partnership with the works team, meaning that rising stars with ties to the big squads could be given an opportunity. The teams could be paired up simply enough. Red Bull and Toro Rosso are clearly natural allies, given that they share the same ownership. 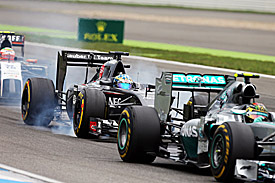 Then Mercedes could partner with Force India, Ferrari with long-time ally Sauber and McLaren perhaps with Marussia. That gives you a guaranteed six cars, and still leaves Williams and Lotus. These are customer-engined teams, and they could continue to operate as independents easily enough. 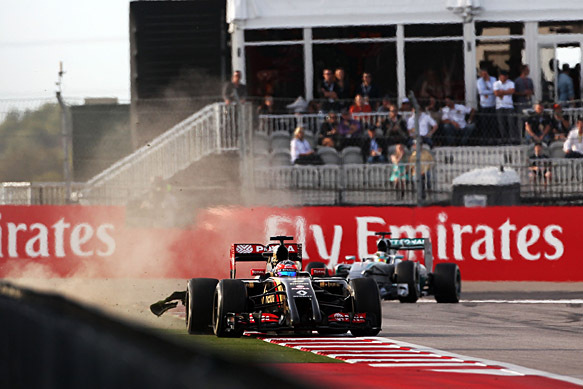 As for Caterham, if it survives, the new Haas team due to join in 2016 and the planned Forza Rossa squad could be accommodated one way or another. Haas already has Ferrari commercial and technical ties, so could become a second junior team there. But exactly how other teams are accommodated should be easy enough to solve once we have safeguarded the 16 works/junior squads. So that should make it possible to have at least 22 cars on the grid next year, more if Forza Rossa happens and, hopefully, at least 24 for 2016. And all will be commercially stable. Perhaps the engines for these independents could be subsidised or paid for out of the FOM money before it's distributed? While this would create a two-tier F1, in reality that is what we have had for a long time. The works teams will do all of the winning, but is that any different to what we have now? Teams such as Force India and Sauber don't have a realistic chance of emerging as world championship contenders, but at least this way they can operate as small, effective outfits capable of getting some good results. Obviously, this is not too different to the existing arrangement with Toro Rosso running Renault engines and Red Bull-produced gearbox internals, Sauber running Ferrari engines and gearboxes and Force India using Mercedes kit. But the big difference is that they will be supplied for nothing, rather than paid for. This could easily cover, say, £25 million worth of a season's budget. The reason that this is the best way to do it is that the new engine regulations were called for by the engine suppliers. It's only fair that they should foot the bill as the engine costs have quadrupled this year. To fit in with the junior teams' status, they should have to run at least one inexperienced driver. This junior driver can be nominated by the parent team. I would also suggest a rule whereby before the first race of the season, the junior driver would not be allowed to have started more than 20 F1 races. This number should always be defined as the number of races in the previous season plus one, so that if you start out as a rookie driver, you have the opportunity to complete two seasons in the 'rookie' driver role. The junior team is then able to select its second driver, along with any relevant sponsorship deals. So there will be the chance to have more experienced drivers alongside the juniors. Obviously, this system of formalised junior teams must go hand-in-hand with other costs restrictions. The only way you save money is by doing less - that stands to reason. So I would suggest that F1 introduces a system whereby car specification is frozen for periods of the season. In much the same way as the gearbox must last a certain number of races, in this case six, I would suggest that a package of aerodynamic and mechanical parts be similarly frozen. You can replace them, but only with like-for-like parts. Let's say that the package must last for six races at a time, but with two 'joker' packages that allow teams to make changes should they be struggling. Imagine you struggle in Australia, you could play a joker for Malaysia and then that spec would be frozen until the end of the Canadian GP. Then you could introduce another spec for a further six races, with the provision for a second joker. Effectively, that could mean you start the season with a car spec and are allowed up to four changes on that specification per season. This would save a huge amount in terms of experimental parts being produced and tried out. 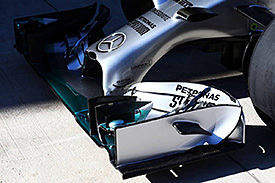 It would also put the onus on teams to fully understand the components they are putting on the car before they do so. It would also allow teams to use the packages strategically. Perhaps a midfield team might like to hit Monza with a very slippery car? They would have to carry that concept through, but could gain a big result from that one race. There are many other ways to save money. This year, there is a common side-impact structure design. Why not have the same thing for the front and rear crash structures? The structures would comply with the FIA's impact-area location but be covered with the teams' own design of lightweight aerodynamic fairing. Teams would then not have to do costly design work, so you'd have another clear cost saving. It would also save the need to do crash tests, which are expensive and can sometimes cost you a whole monocoque. There is big money to be saved by taking a logical approach to components like this beyond the engine. If you can do this while still allowing teams to produce the parts that make a real competitive difference, then you still have F1 as we know it. The only difference is that it's a more sustainable, realistic F1 that will ensure we have enough cars on the grid to give the fans a great spectacle. 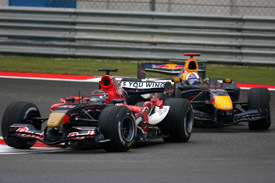 Gary Anderson is best known as the former Formula 1 technical director who helped Jordan into F1. He helped design the first Jordan-Ford 191 and remained with the team until shortly before it took its maiden victory at the 1998 Belgian Grand Prix. Following Jordan, Anderson helped Stewart Grand Prix produce a race winner with the SF3 for 1999, prior to a spell with the team when it was renamed Jaguar. After leaving Jaguar, he had a spell with Reynard in CART before returning to Jordan briefly as a consultant in 2002 and 2003. Now in semi-retirement, he remains a consultant for various motor racing projects and is also AUTOSPORT’s technical editor.